When we asked "which CPU cooler are you using?" it was no surprise to find that a few folk were rocking a Cooler Master 212. The original may be getting old, but newer variants are readily available and at under £30 the 212 remains a viable option for many users. But what if you need something a little more extreme? 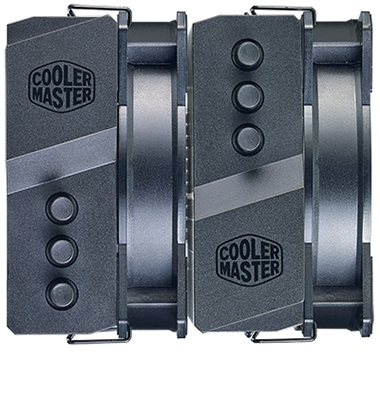 That's where the Cooler Master MasterAir MA620P comes in. 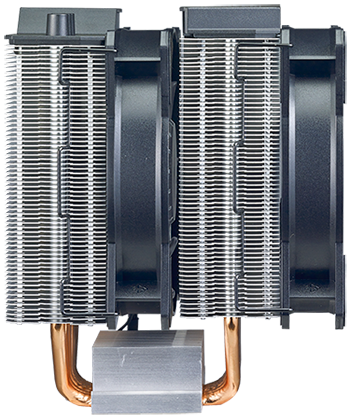 Described by the manufacturer as "an engineering masterpiece," the MA620P is said to adapt the favoured 212 heatsink design into a dual-tower form factor better suited to enthusiasts. The bad news for fans of the 212's attractive pricing is that the meatier MA620P form factor results in a lofty £75 asking fee, putting the cooler within the firing line of, say, a Noctua NH-D15S. This is a pricey piece of kit, yet it appears to maintain the lower-cost aesthetic of the 212. The combination of copper, silver and black materials doesn't convey a truly premium feel, and while the plastic top cover adds a bit of interest, we had expected a metal lid at this price point. On the plus side, if you happen to be partial to a bit of RGB lighting, MA620P comes with a pair of MasterFan MF120R RGB fans as standard. 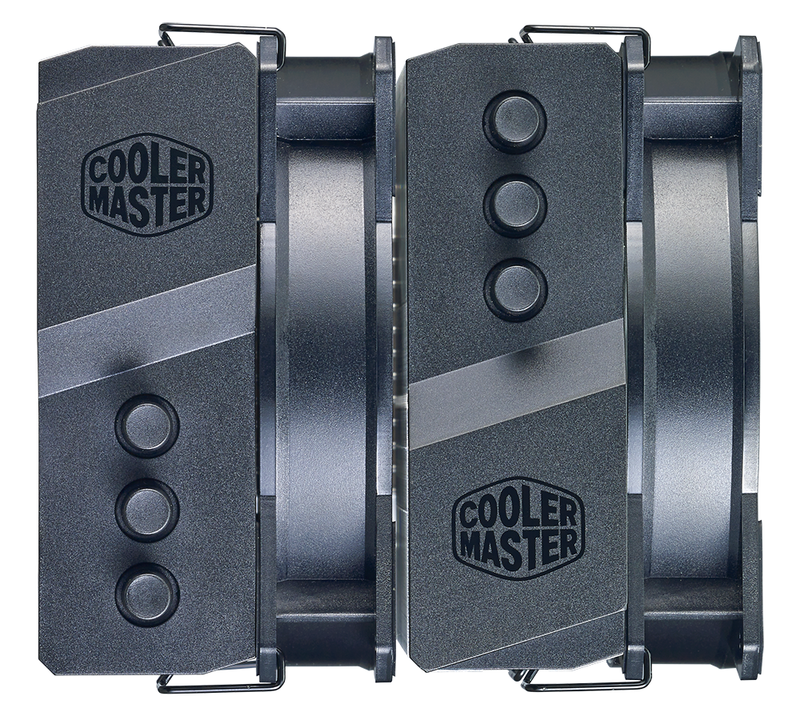 PWM controlled and able to modulate speed from 600 to 1,800RPM, the blowers promise good air flow with minimal noise and a vast choice of colours or effects. 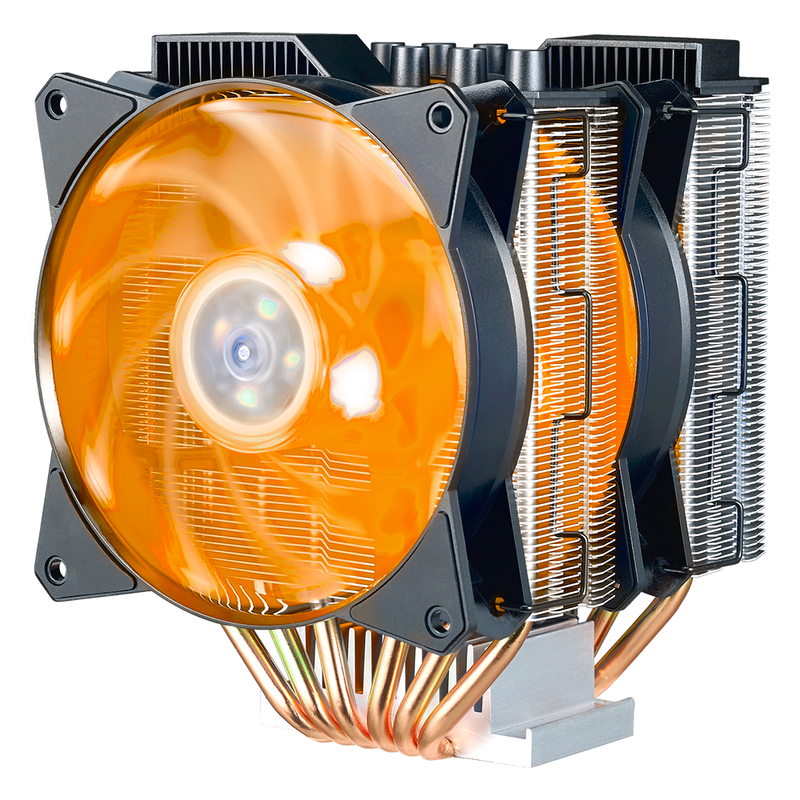 Cooler Master includes a wired controller that allows you to adjust brightness, colour or mode at the touch of a button, but we imagine most users will choose to connect the fans to a motherboard lighting header via the supplied splitter cable. Asus Aura, Gigabyte Fusion, MSI Mystic Light and ASRock RGB LED are all certified as compatible, making light work of synchronisation with other hardware. 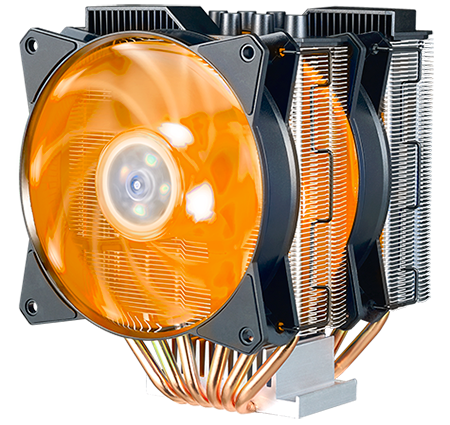 Cooler Master's illumination looks neat and is suitably bright, though one has to question the value of the RGB fan sandwiched between the heatsinks; it can barely be seen and a non-illuminated fan would have sufficed. 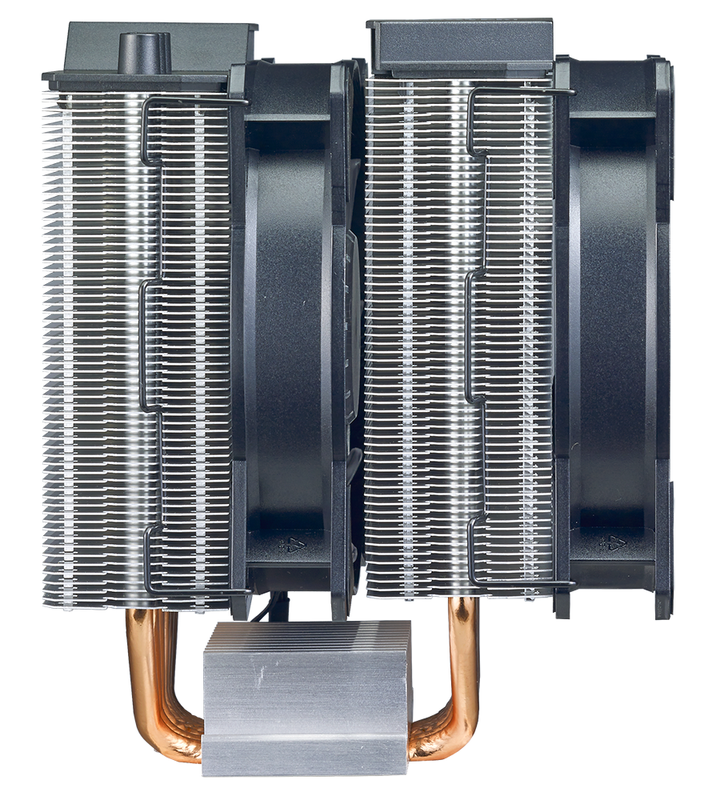 We do, however, like the fact that both fans are pre-installed using nickel-plated brackets, and an extra set of mounts are supplied should you choose to add a third fan to the back. 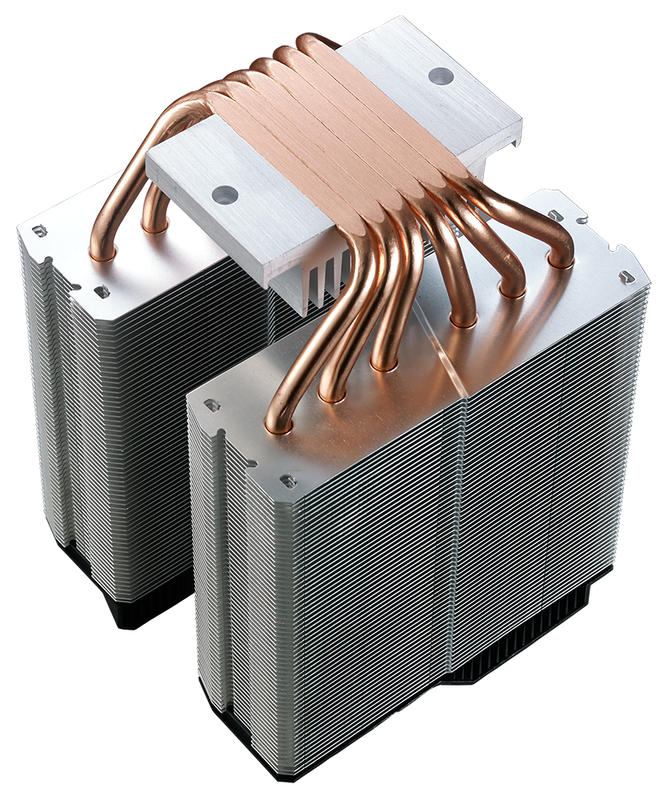 Heatsink dimensions of 116mm x 110mm x 158mm make the MA620P a sizeable unit, but in return you obtain two stacks of aluminium fins and half-a-dozen 6mm copper heatpipes that make direct contact with the CPU. 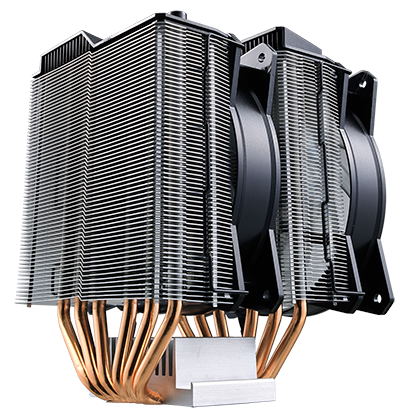 Cooling performance should be strong, but as with most air coolers of this scale, RAM clearance can be an issue. There's just 36.5mm of clearance with the front fan in its default position, and though this can be increased to 53mm with the fan raised to a higher level, your mileage with tall modules will vary depending on motherboard layout. Occupying a lot of space around the CPU socket is one downside to an air cooler, and another black mark against the MA620P is that it's a real pain to install. The process starts off harmless enough - you fix a backplate to the rear of the motherboard and attach the standoffs - but next is the tricky part. With the mounting brackets attached to the heatsink, you're asked to fit and tighten four bolts using the supplied wrench. 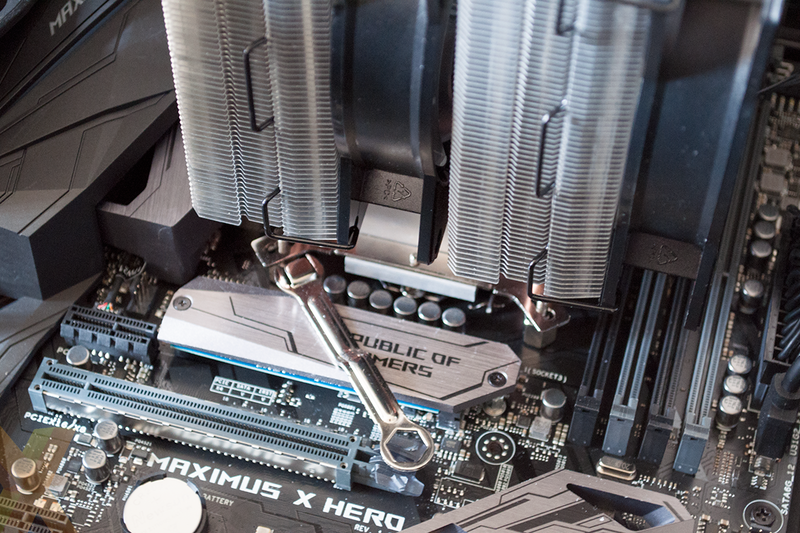 This might be easier on less-busy motherboards, but getting the bolts in place on our Maximum X Hero took more time and patience than we deem necessary for a CPU cooler; you ideally need small, nimble fingers, but even then it's a fiddly process that is far from user friendly. Awkward installation increases the chance of spoiled thermal paste - there's only a small tube included in the bundle - and it's a shame Cooler Master hasn't adopted a Noctua-like mounting kit that can be screwed tight with ease. Socket support, meanwhile, includes all the latest AMD and Intel platforms bar Threadripper, for which Cooler Master has a dedicated TR4 variant dubbed the MA621P. A standard two-year warranty rounds out the package, now let's take a closer look at performance on our overclocked Core i7-8700K test system.